The ruling party seems in far better shape than the Congress, which is yet to finalise seat-sharing agreements in several states. Having firmed up alliances in several key states for the Lok Sabha polls, the Bharatiya Janata Party has taken an early lead over its rivals, including the Congress, for an election where every single percentage point of votes brought in by small partners can have significant bearing on final results. While the BJP has had uneasy relations at times with some of its allies, many leaders feel the party president Amit Shah has walked the extra mile to ensure they remained in the ruling National Democratic Alliance by offering them a generous seat-sharing deal, as in Bihar, and by accommodating most of their concerns. In a big state like Tamil Nadu also, where the BJP has remained a minor player so far, it has risen into reckoning by stitching an alliance with the ruling All India Anna Dravida Munnetra Kazhagam and by working on smaller Dravidian parties to join the NDA. In states like Bihar, Maharshtra and Tamil Nadu and where combination of allies will be crucial, a BJP-led alliance is already in place while the Congress is still working out finer deals with its partners. The main opposition party has been squeezed out of the Samajwadi Party-Bahujan Samaj Party mahagathbandhan (grand alliance) in Uttar Pradesh, which may help the BJP in the politically most crucial state where swing of a few percentage of votes can swing the poll pendulum to the other side. BJP's two allies in Uttar Pradesh -- Apna Dal and Suheldev Bharatiya Samaj Party -- have been airing their grievances with their bigger partner but the saffron party leaders have expressed confidence that they will remain in the NDA fold. The opposition's grand alliance in Bihar, which has as many as 40 Lok Sabha constituencies, remains an unfinished task due to differences among parties like Lalu Prasad-led Rashtriya Janaat Dal, the Congress, Upendra Kushwaha-led Rashtriya Lok Samta Party and Jitan Ram Manjhi-led Hindustani Awam Morcha over their respective seat demands. On the other hand, the three NDA constituents in -- the BJP, chief minister Nitish Kumar-led Janata Dal-United and Union minister Ram Vilas Paswan-led Lok Janshakti Party -- have already announced that they will fight 17, 17 and six seats, respectively, in the state. The BJP had in 2014 contested on 31 seats in Bihar and bagged 22, but agreed to give up its claim on even its winning seats to accommodate Kumar, who had fought against the party in the last general elections. The difference between the BJP and the Opposition lies in commonality of purpose that the saffron alliance has unlike its rivals, who have "no clarity over leadership" and they seek power for the sake of it, the ruling party's spokesperson Nalin Kohli said. "Under Prime Minister Narendra Modi we have clarity about leadership and our agenda that is based on development," he said. In Maharashtra, the BJP and Shiv Sena have agreed to fight 25 and 23 seats respectively. The Sena had been threatening to go solo but was brought around with an offer of more seats for the party in the Lok Sabha as well assembly polls. The Congress is yet to finalise a seat-sharing deal with its Maharashtra ally Nationalist Congress Party and also with its partner Janata Dal-Secular in Karnataka. A senior Congress leader said the party will discuss the issue of alliances in its CWC (Congress Working Committee) meeting in Gujarat on Tuesday and will finalise them in the coming days. The Lok Sabha elections for 543 seats will be held over seven phases, beginning April 11 and ending May 19, while results would be announced on May 23. BJP's spokesperson Shahnawaz Hussain said, "We had won a majority on our in 2014, but we still gave due respect to our allies. While alliances of opposition parties are all about leaders, seats and their anti-Modi ideology, BJP's alliance percolates down to our workers and supporters." "The opposition's alliance is in bad shape everywhere due to its negative agenda, while our alliances are based on the positive message of development and stron leadership," he said. The BJP has also managed to keep all major non-Congress regional parties in north-eastern states in the NDA fold. However, the BJP has failed to seal alliances in some states such as Andhra Pradesh and Telangana, through its leaders feel some key players in these two states might veer towards the NDA after the elections. As per the party's internal calculations, Jagan Reddy's YSR Congress, the main challenger to the ruling Telugu Desam Party in Andhra, and the incumbent Telangana Rashtra Samithi in neighbouring Telangana, are more likely to join the BJP-led alliance if more allies are required in a post-poll scenario. Is Modi more popular in 2019? 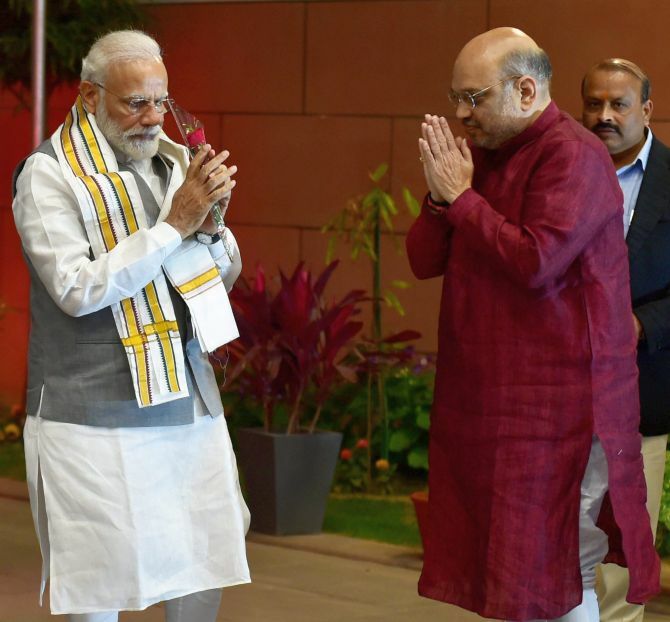 What are Modi-Shah's plans for Lok Sabha polls?